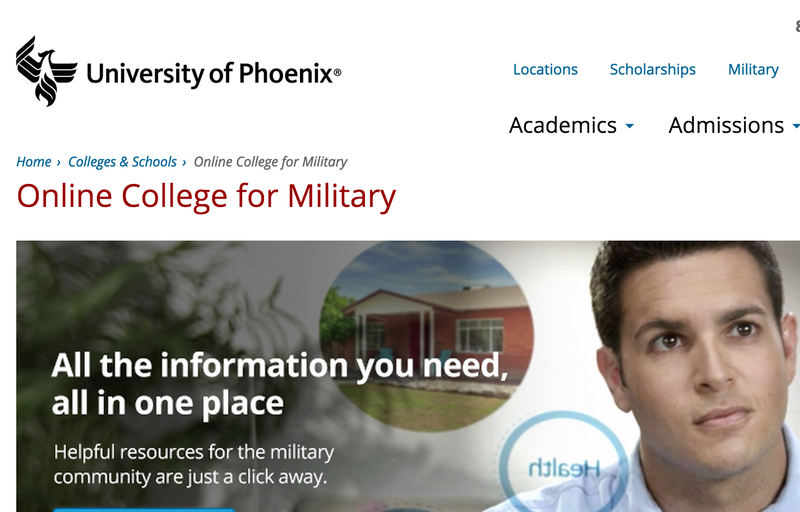 For-profit college chains like the University of Phoenix spend a lot of time and money recruiting active-duty military personnel. But the school has come under fire in recent months for allegedly crossing some legal lines in its efforts to attract students from the armed forces. Yesterday, Phoenix’s parent company revealed that the school is currently barred from recruiting on U.S. military installations, and that Department of Defense tuition assitance funds can not be used to pay for classes for new students. Apollo Education Group, which operates the University of Phoenix and a handful of other for-profit schools, announced in a filing with the Securities and Exchange Commission that Phoenix has been placed on probation by the Department of Defense, meaning its participation in the DoD Tuition Assistance Program for active duty military personnel is on hold. Additionally, the school revealed that the government is considering the possibility of axing Phoenix’s involvement in the program altogether. The probation does not change the eligibility of students currently enrolled at U. of Phoenix. These students will be able to continue using money from the tuition assistance program. Newly enrolled students and those that transfer in from other schools will not be deemed eligible while the school is out of the program. Conditions of the probation bar the schools from recruiting on bases, which includes job fairs and other events. The school was also accused of deliberately misleading servicemembers into believing that Phoenix was sanctioned and recommended by the DoD. It went so far as to create and hand out custom engraved coins to servicemembers. The coins featured the school’s logo on one side and the emblems of all military branches on the other, and was similar to a “challenge coin” given to military personnel by officers to mark major accomplishments. This report kicked off investigations by federal and state regulators who believed the school may have been violating laws against deceptive advertising and against the misuse of military insignias. Apollo claims that it has been in discussions with the military regarding the “manner in which approvals will be obtained for future sponsored events at military installations” in accordance with regulations. The DoD has given Phoenix two weeks to respond to its probation notice. After that, it will decide whether to reinstate the school or terminate Phoenix’s participation in the tuition assistance program.